I would consider trying to find someone in the field or who *is* doing what you want to do or something vary similar and see if you can shadow them or become an apprentice. I am a huge supporter of apprenticeships, because in many ways I feel that they are more authentic and sustainable as apposed to getting a degree and then a *job* in a field. You can also do some freelance writing for publications, which would appreciate pieces written that pertain to your passions. I've got more ideas too, but it's late and I've had a busy day. I look forward to having a chance to talk with you at the conference next week...maybe I can help your brainstorm some more. I'm wondering if you are actually adverse to university? I think it would be a shame to avoid or discount uni out of unschooling philosophy because although it's an educational institution and all that, there is huge scope for accommodating unschoolers. Especially if you choose to study what you are passionate about, the human sciences etc, the degree or qualification or outcome is irrelevant. It's actually where I first learned about unschooling and the insidious cycle of education's role in society etc. Loads of wonderful things to be discovered through uni. Also like minded folk into veganism etc. I go to an unschooling school for adults whose founders are pro-unschoolers. It's called The Learning Connexion, it's an international school, anyone is able to do it from anywhere in the world. I can understand your fears though, I think about what might happen to my unschooled children at your age because of the minority type of person they will be when that time comes. It might be quite an alienating kind of a time finding how to go fourth in the world whilst sticking to your values. It's a challenge for anyone into unschooling/uninstitutionalising/self responsibility, young or old. Lots of great ideas here! I particularly like Michele's. I was an employer for 7 years and came across hundreds of resumes and almost always gave the job to the candidate with the most experience over education. Internships, internships, internships! It might take 3 years of interning for free with various positions. Idzie, I don't have much in the way of helpful suggestions, but I wanted to say that I am totally in the same place you are right now with all of this. Most of my friends are in college, and while they're never directly critical of me, I do get the sense that they feel they'll get further in life than I will. It's frustrating, and it's scary not knowing what my path is going to be yet. I did two years of college, though, and while I had fun, it didn't get me any closer to knowing what I want to do. I actually sort of felt like I was just stalling. I'm sure a lot of college students *are* just stalling. It's like everyone else is following a paved road and we're cutting our own paths through the wilderness. It's a lot more work, and there are may be more thorns in the way. But in the end we'll get to see things in a way that most people never will, and have the satisfaction of knowing we chose exactly the way we wanted to go. You're only 18, and society seems to think people should suddenly snap into adulthood on their 18th birthday, but that's unrealistic. You can't burst into adulthood as an expert at being an adult. No one does. I'm about to be 24 and I still don't quite know where life is going to take me, but I don't feel like I'm necessarily "behind" either. I've had plenty of jobs and none of them has led directly to a career, but that's okay! Maybe you could use the next few years to try out many different jobs. Even if you try something and end up hating it and quitting, you'll still learn from it, and you'll have a clearer idea of what you want and don't want out of a job. And you might stumble on something you love doing that you wouldn't have thought you would like. Are you going to the Autodidact Symposium in March? It's supposed to be geared toward young adult unschoolers and helping us find our way into what sort of paths we want to take. There will be mentors there giving information on some different paths. I'm going to try to go, and I'm really hoping to get some good ideas there. Have you considered living on a commune or something like that? Personally I really like Twin Oaks, in Virginia. A lot of them are very ecological, not internally based on a money system, and you can try and learn about many different kinds of work from experienced people. The Federation of Egalitarian Communities has a big list of links to websites you could check out for places all over the world. Also, there are similar places where you can do internships or work for room and board, such as Willing Workers on Organic Farms and places that teach things like eco-building, and I think the Tom Brown wilderness training programs which are pretty popular with primitivists. For a while I took a really great natural healing course online from a place called the Anima Center. Mine wasn't focused on herbalism, but they have some that are, they are very very into ecology, nature and wildcrafting, and the tuition is sliding scale and pretty reasonable for what you get. I think they may also have residential internships. The one suggestion that I can offer, that was a lifesaver for me years ago, is getting into the caregiving profession via becoming a nurse-aid at a nursing home. Often you can just take a class to get your initial certification, the money is decent (you can support yourself on it for sure), and if you want to go further with nursing you can take classes and go for your nursing degree. It is very good and necessary work, karma-positive, and in terms of anti-civ I see it in the context of providing damage-control for people. If it wasn't for becoming a caregiver I would probably still be working factory jobs, and for that I am immensely thankful. Just relaxing, and sorting everything out in my head sometimes also helps everything else outside of my head. If that makes any sense at all, hah! But seriously, de-stressing can make all the difference sometimes. Good luck with everything, and I'm so sorry about Flora. Your post about her made me cry! I've been looking into permaculture, and forest gardening as an application of it lately. And now I'm seriously considering getting some land in order to start such a project. This idea of course may be totally not what you're looking for. But just for the hell of it, I'm thinking that perhaps you could find people, likeminded people who don't have the time to do something like this but would like to support such a project and also possibly benefit from it by being able to get healthy food and knowing that the production of their food also participates in the restoration of some land, theirs and yours perhaps. Or some other kind of arrangement. Anyway, you seem to have a talent for communicating. So perhaps something like I mentioned would be a good setting for learning, and teaching others about what is truly sustainable and all. Like I said, this is an idea that just popped in my mind, and perhaps not a good one. I don't know yet. Just thought I'd share. It might lead you to other ideas more suited for you. I don't know. For instance, an acre of land that is designed for maximum yeld will feed double the people that modern agriculture will...and without destroying topsoil and ecosystems, but rather restoring them. I don't know if this is any help to you. @Idzie, Since my undergraduate degree is in anthropology, I can attest to the difficulity of making a living with my degree. I ended up with a Masters in education and am teaching middle school Reading. It fun because I teach a process not content, so I can pick what we read to practice. It's the closest I can get to allowing kids to learn naturally. Hi, I stumbled upon your blog in the links for one of the people who follow mine. This post feels familiar, as I have gone through similar things. It is often difficult to figure out a path when your beliefs run against those of the dominant culture. This becomes even more complicated when your overarching goal is integration into the natural world. As an anarcho-primitivist and someone who lives a very non-traditional life, I know how this can create conflicting desires. What I have found liberating is to engage in everything I find interesting - there's no reason you can't study cooking AND herbal medicine AND anthropology. The majority of people seek to become "experts" in some specialized field, but it is more fulfilling to gain a wide variety of knowledge. This can be difficult in practice, but things have a way of working out. For example, I am majoring in Women's Studies at a university in pursuit of working with abuse survivors, which I feel is vital work in the fight against civilization/patriarchy. Independently, I teach myself primitive skills and plant identification and study ecology, anthropology, anarchist and feminist theory, literary criticism, and a wide variety of other disciplines. Monetarily, this careerlessness requires me to find alternative ways of getting what I need to live - i.e. dumpster diving, hitchhiking, DIY skills, etc. But, in the end, I feel that the constant pursuit of whatever interests me intellectually is more important than trying to fit all of my expansive and contradictory desires into a career. Before saying anything else, I simply want to thank everyone for their comments. It means so much to me that so many people care about my struggles to follow my own path, and are there to offer their advice, suggestions, sympathy and support. So thank you all! @Michele: I've always loved the idea of apprenticeships!! It seems like a much better way to learn than traditional schools, and I feel like I would thrive in that type of setup. Thing is, I don't know anyone IRL who is doing anything remotely like what I want to do, and I'm not sure how to find someone who is. I should be writing reviews for a homeschooling magazine starting up again this fall, and I've been poking around for other magazines that may be willing to accept some of my writing (as well as contributing to a zine... Thanks David!)... I love to write, and feel it will always be a large part of my life. However, none of the publications I've found that seem interesting, and seem like they'd be likely to accept my stuff, pay anything for articles... It seems my passions, or more accurately my passions that I currently have any skills in, pay very little or nothing at all! Perhaps I'm wrong, but that's what it seems like at the moment. @Bethany: Thanks, I'm glad to hear that! I'm hoping that I can manage without having lots of paperwork, and simply gathering lots of experience instead! I feel that there's a lot of truth in your words, that wherever we end up, we'll have the satisfaction of having chosen our own path. I do *know*, when I stop worrying long enough to think properly, that I'll figure things out, and end up in a place, and with an ongoing journey, that I'm happy with. The uncertainty and worrying just get in the way sometimes! @David: Thanks for the suggestion! My mother trained as a nurse, though she quit in her final semester, after having worked, and hated working, in a hospital... Hers was a bad experience, but from what I've gleaned from both her and other people working in the health care profession, I don't think that's what's right for me. I am, however, very interested in alternative health care, and want to learn how to take care of myself, and to be able to help others learn how to take care of themselves, without hospitals and clinics... I figure it's something that's both helpful to the world (especially from an anti-civ perspective), and something that genuinely interests me, so I should probably at least try following that interest, and see whether it's something I want to pursue in the long run! @Stella: Thanks. :-) Yeah, that societal expectations thing can be tough... It may be a bit harder at 18, but it's still hard at 16 as well, from what I remember! :-S Good luck to you as well! Also, thank you about Flora. I'm sorry I made you cry, though! @L: One of the things that helps me the most is hearing from people who are actually living non-traditional lifestyles, people who are doing just fine without following the prescribed paths. So thank you very much, your comment means a lot to me! I can't imagine focusing only on one thing, and I do think I'll end up making money (and managing to do things without money) in a variety of ways. There are WAY too many things I'm interested in to ever pick just one! Idzie, sorry you can't make the symposium, but I'm glad you're going to Northeast! I'll be there too, I look forward to meeting you! @Bonnie: Awesome!! I'm most definitely looking forward to meeting you as well. :-) I keep discovering more and more people whom I've only *met* online that are going to the NEU, which is really cool. Your blog title says that you can write. Did you know you can make money writing? :-) Novels, poetry, plays, essays, journalism, there are lots of genres to try. Are there any non-profit organizations saving the planet in a manner you appreciate? Have you considered volunteering to help them? That can grow into paying work, too. You don't need to pay a dime for education, if you find something you love, then approach someone else who loves it and ask them for advice. Most such people will not want to teach you-- but some will LOVE to teach you. It's wonderful to work with students who are truly dedicated. Don't pursue fields you aren't passionate in. EXCEPTION: you can TRY many fields to see if you are passionate about them. Personally, I am working on another book about learning. I hope to make that my sole occupation. hi- found your blog thru growing naturally. 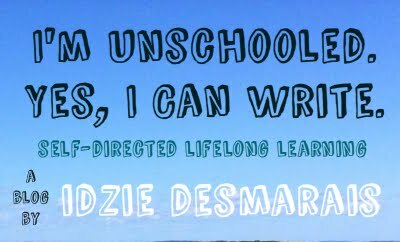 i'm an unschooling/life learning mom of 2 little ones, and i think about A)what they may face in the future, and B)how my life could have been different if i had had the opportunity to unschool. one of the best things i did in my traditional education was a year of service. i volunteered in a community center in kentucky, got a stipend, and learned so much about life/people! there's so many opportunities for research/interviewing/understanding people/experiences that can really benefit one in search of the next turn on the path of life. hope you find what you are looking for/need!